•Upload your own songs – no tacky, tinny repetitive tunes! •It has four sleep functions, meaning that you can programme it to turn itself off after 5, 10, 15 or 20 minutes. 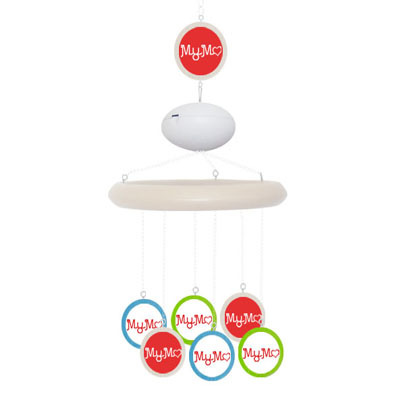 MyMo has taken qualified research regarding the cognitive development of babies and infants, to design a baby mobile that maximises the learning and development potential for them. 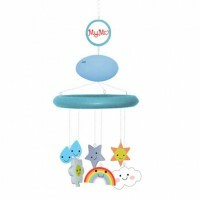 Not only is it adorably designed, but its design and adaptability allows the mobile to be modified in conjunction with your baby’s development. According to Educational & Developmental Psychologist, Anita Doyle (BA, MA, M. Psych (Ed &Dev), MAPS), newborns like to look at brightly coloured, simple abstract pictures. By the time they are just a few months old they recognise faces and can even recognise photos of their mother. For these reasons, all of the hanging characters are brightly coloured and have individual faces. Additionally, the photo frame which comes with the mobile means parents can regularly change photographs and/or images to suit their infant’s developmental stage. Furthermore, if parents prefer, photo frames can be chosen in lieu of characters, so many photographs of loved ones can be displayed for your baby via the mobile. It has also been proven that from the time they are born, babies not only recognise, but prefer the sound of their mother’s voice, and can even recognise the sound of their own name by the time they are six months old. Furthermore, when settling crying babies, continuous rhythmic sounds have been proven to be most effective. MyMo’s voice recorder/MP3 player allows parents to record – and then play back – their own voices for their baby to listen to. This is especially valuable for working parents, who might not get to spend as much time with their babies as they would ideally like to. Alternatively, favoured music and soothing tunes can be uploaded easily as MP3 files. Every MyMo comes beautifully packaged to instantly create a special and unique experience for the end recipient. 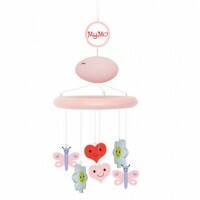 We take pride in always providing a high quality and unique product for parents and babies. For orders within the United Kingdom, customers can choose between Standard UK Delivery (which takes 3~5 days) or UK Special Delivery (which is next day guaranteed). We also ship internationally to all other countries.